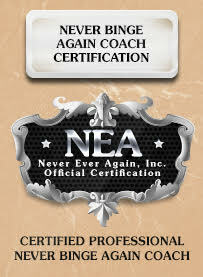 Contact Never Binge Again Master Coach Fiona Now! "I attended a workshop that Fiona ran called “Change Your Thoughts On Food”. The whole workshop was really well run. Fiona used some NLP techniques to change our way of thinking. I was a volunteer to give up chocolate as I have a horrendous sweet tooth and battle with willpower, I always give in. Fiona did a quick but powerful exercise that immediately made me feel sick at the thought of eating chocolate. 4 days later I haven’t even had the urge to eat chocolate, cake, biscuits or sweets. Currently going through symptoms of sugar reduction symptoms but feeling really positive. Just goes to show how massive my sugar highs were. Thank you Fiona, this is just so massive for me and I am so pleased with the results." “So I had my first Never Binge Again session with Fiona! With her suggestions I’ve adapted my food plan to make it easier to remember. I was also complaining about my lack of willpower. From what we worked on I now realise that I don’t need willpower. I need to choose to follow my new plan, willpower doesn’t come in to it! I LOVE this system. I now have hope for the first time in a very long time.